First off, I want thank the folks over at Crown for providing a copy of The Chalk Man for review on my blog. This is no way influences my review, but it is quite a nice gesture! 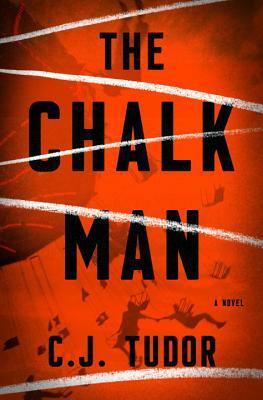 The Chalk Man is a thrilling and captivating debut by C.J. Tudor and it is a wonder that this is her first published work. The hype surrounding this novel is legitimate and I would recommend it to anyone who likes their thrillers with a slow burn. 1986, Eddie and his friends live fairly normal adolescent lives in the small town of Anderbury; riding bikes around town, sneaking out at night, and creating their own secret code using chalk stick figures. Each kid has their own unique color and can signal one another via driveway when a meet up is needed. Of course, just when things seem to be going well, they can take a horrific downturn in an instant. When the boys round up for one of their daily meets, a random and mysterious chalk man leads them to uncover the dismembered body of a local girl, known as Waltzer Girl (you’ll understand when you pick up a copy :D) and their lives are changed forever. Flash forward to 2016 when Eddie and his mates are grown up, each living their own independent life but still keeping in contact with one another, mostly anyway. With the past mostly in the rearview mirror, Eddie believes he can live out the rest of his life in peace and normality. That is, until he receives an unmarked envelope in the mail containing a chalk figure. Turns out, he isn’t the only one of his mates to receive such a letter, but they all put it off as some sort of joke – well, until one of the crew turns up dead. The best thing about this novel is the air of mystery surrounding the entire town. Each character keeps and slowly divulges their own secrets throughout the pages, keeping the reader at bay and anxious to flip to the next page. I would categorize this as a gripping thriller as it literally will not let go until the very end and it may even attempt to maim you on the way. Tudor did a fine job alternating between timelines and brought it to a seamless conclusion, answering the main question but leaving plenty for the mind to wonder. Just as an FYI, there are a few graphic scenes in the novel, but it is fairly tame overall. The Chalk Man is a pretty quick read (only around 280 pages) but is worth every page turn. Tudor has already cemented herself as a staple in my TBR thanks to this novel and I cannot wait to see what she has next.